White Collar Crime in Georgia--A Blog By The Goolsby Law Firm, LLC. (706) 863-5281: Goolsby Brag Board: S.C. Law Practice! 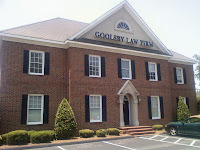 Goolsby Brag Board: S.C. Law Practice! I hope that the followers of this blog, written by an Augusta, Georgia criminal lawyer, (and former federal prosecutor), don't get too tired of reading posts about our lawyers' successes! I have one more accomplishment to boast about today! Today, we learned that both my sons, Ric and Blake, with whom I practice law have passed the South Carolina Bar Exam, (and on their first attempt, too)! Of course, they already were licensed to practice law, here, in the State of Georgia. But now, we will be able to help clients with legal matters in BOTH states! Since Augusta, GA is close to the state boundary with South Carolina, it made sense for us to be able to handle cases in both states. And now, we will! Naturally, I am a very proud, fortunate father to have the opportunity to practice law with my two sons! And I can't wait until my third son, Zachary, graduates from law school and joins us in just a year! So, now you can see why we are so happy today at the Goolsby Law Firm! This is an accomplishment worth bragging about!